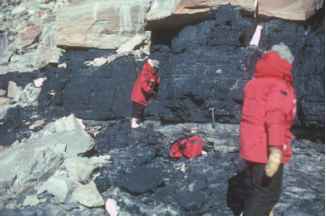 FIGURE 1.30 Exposure of coal in Antarctica (Permian). Hammer = 30 cm. useful tool in identifying plant parts preserved in lignites (Alvin and Muir, 1969). In some lignites it is possible to tease apart the plant fragments and make whole mounts of various structures, for example in the Brandon lignite, a famous early Miocene plant locality in Vermont, USA (Haggard and Tiffney, 1997). FIGURE 1.31 Marie C. Stopes. leaf tissues and wood to identify various biomolecules (Yang et al., 2005). The components of coals can also be useful in documenting paleoecology (Poole et al., 2006). Macerals are defined as the organic constituents that comprise coal as seen in polished thin sections. 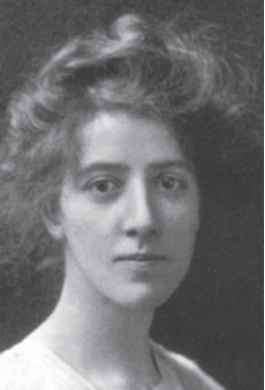 The system of maceral types was originally proposed by the paleobotanist Marie C. Stopes (FIG. 1.31) in 1919, expanded in 1935, and is constantly kept up to date (ICCP, 2001). 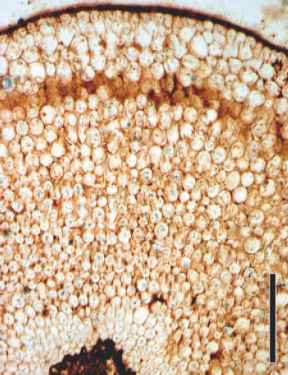 Maceral names end in -inite; for example, funginite is made up of fungal spores and various fungal bodies, secretinite is composed secretory deposits formed by medullosan seed ferns (Lyons, 2000), and sporinite consists of the sporopollenin walls of fossil pollen and spores. More detailed studies of coal composition provide valuable information about environmental parameters. For example, G. Taylor et al. (1989) suggested that the association of alginite and inertodetrinite (rede-posited small particles of fusinite) in the Permian coals of Australia indicates a paleoenvironment of wet, cool summers and freezing winters. It is possible to distinguish between angiosperm and gymnosperm woods in some coals using macerals (Sykorovâ et al., 2005). also called fusinite) is also an important source of paleobo-tanical data (Cope and Chaloner, 1985; Lupia, 1995), with charcoalified plant remains dating back to the earliest land plants (Glasspool et al., 2004b). There are several techniques used to examine fossil charcoal (Sander and Gee, 1990; Guo and Bustin, 1998; Figueiral et al., 2002) which provide information on taphonomy and paleoecology (Scott et al., 2000), including past atmospheric composition (Scott and Glasspool, 2006) and the presence of fire in paleoecosys-tems (Uhl et al., 2004, 2007a; Collinson et al., 2007). 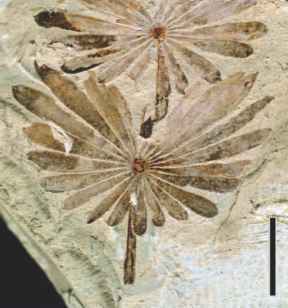 The discovery of beautifully preserved charcoalified flowers in Cretaceous (Tiffney, 1977; Friis and Skarby, 1981) rocks from around the world has contributed large amounts of information to our knowledge of early flowering plants (see Chapter 22). In North America, Carboniferous coals of different ages are typically characterized by the dominance of different types of swamp plants (Cross and Phillips, 1990). Among the Pennsylvanian coal beds for example, lycopsids, tree ferns, calamites, seed ferns, and cordaites constitute the major types of tropical-subtropical arborescent plants that contributed to the peat formation. Although Carboniferous peat swamps have represented the model system in most interpretations of coal-forming ecosystems, the plants lived in atypical terrestrial communities in which the pH and available nutrients were low. It is now becoming apparent that such factors as types of litter accumulation, nature of the biomass, preservational characteristics of certain tissue systems, microbial diversity, biology of the plants, paleoclimate, and paleogeography are but a few of the parameters necessary to understand and properly interpret coal-forming ecosystems through geologic time (Cross and Phillips, 1990; DiMichele et al., 2002, 2007a). An important study by Gastaldo et al. (2004) underscores the fine resolution needed to understand fossil plant community structure, using an in situ three-tiered forest above a Pennsylvanian coal in Alabama, USA, as the data set. Detailed sampling of this fossil forest indicated that the proportion of canopy, understory, and ground-cover plants was variable across the study area, and that wet-dry gradients and/or increasing habitat specialization did not control the distribution of the plants species in this swamp ecosystem. (Ergolskaya, 1936a; Krassilov, 1981a). It is a simple matter to isolate these cuticular fragments by using a chemical base such as potassium hydroxide. The cuticle can then be washed, stained in some cases, and mounted directly on slides for examination (DiMichele et al., 1984; Kerp and Barthel, 1993). Lenses of leaf fragments may sometimes be preserved within coals; these apparently formed in small depressions containing acidic water, which inhibited the normal degradation activities of various microorganisms (Gastaldo and Stub, 1999). In other instances, coals have been found to be made up exclusively of algal remains (see Chapter 4), some as early as the Precambrian (Tyler et al., 1957). Kerogen is a type of fossilized insoluble organic matter that is widely found in sedimentary rocks, and is a common component of various paleobotanical preparations. It is the most abundant form of organic carbon on Earth—more even than coal deposits. The presence of kerogen in rocks has been used as evidence of some of the earliest life on Earth (Moreau and Sharp, 2004; see Chapter 2). Understanding the chemical composition and source of kerogen, termed "typing" the kerogen, is especially important, since these factors help to determine the petroleum-generating potential of source rocks. In the past, kerogen and coal were generally analyzed using just thin sections and light microscopy. Today, both substances are also characterized using standard geo-chemical methods, such as pyrolysis, gas chromatography-mass spectrometry (GC-MS), analysis of carbon isotopes for total organic carbon (TOC), and others. There are a variety of other techniques available today to investigate the nature of the organic matter that remains after fossilization and to compare the carbonaceous residue to determine the chemical-structural characteristics. Raman spectroscopy has been used to characterize carbonaceous matter in highly metamorphosed rocks for some time (Nestler et al., 2003), but has recently been applied to microscopic fossils preserved in chert of varying ages (Schopf et al., 2005). Unlike most geochemical techniques, Raman spectroscopy is a non-destructive means to analyze ancient organic matter. It provides information on the original biochemistry of the organism, and can help resolve the nature of certain ancient fossil-like organisms (see Chapter 2). Another approach that has been used to examine the chemical composition of fossil plant materials involves energy-dispersive X-ray microanalysis (EDXMA). With this technique the elemental composition and spatial distribution of fossils can be studied without damaging the specimen (Briggs et al., 2000). Other have used EDXMA to map the distribution of elements in fossil cells (Boyce et al., 2001), and cell walls (Boyce et al., 2002). FIGURE 1.32 Impression specimen of Osmunda claytoniites from Triassic of Antarctica. Bar = 2 cm. FIGURE 1.33 Impression of several whorls of Annularia stellata leaves (Pennsylvanian). Bar = 1 cm. What type of fossil indicates a presence of coal? 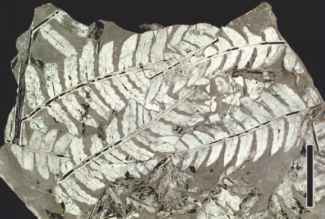 Is coal a fossilized plants? How are lignite formed in plant cells?